There is a growing consensus in social sciences that there is a need for interdisciplinary research on the complexity of human behavior. At an age of crisis for both the economy and economic theory, economics is called upon to fruitfully cooperate with contiguous social disciplines. The term ‘economics imperialism’ refers to the expansion of economics to territories that lie outside the traditional domain of the discipline. Its critics argue that in starting with the assumption of maximizing behaviour, economics excludes the nuances of rival disciplines and has problems in interpreting real-world phenomena. This book focuses on a territory that persists to be largely intractable using the postulates of economics: that of primitive societies. 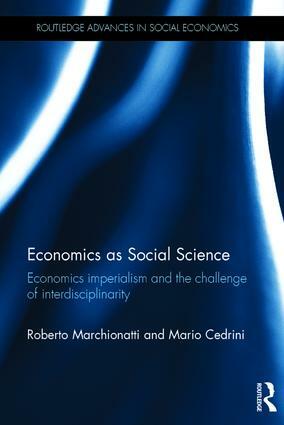 In retracing the origins of economics imperialism back to the birth of the discipline, this volume argues that it offers a reductionist interpretation that is poor in interpretative power. By engaging with the neglected traditions of sociological and anthropological studies, the analysis offers suggestions for a more democratic cooperation between the social sciences. Economics as Social Science is of great interest to those who study history of economic thought, political economy and the history of economic anthropology, as well as history of social sciences and economic methodology. 1.2 Adam Smith: a conjectural primitive economy, or the model of the "early and rude state of society"
6.2 Pierre Clastres on the relationship between war and gift exchange in societies "against the state"
Roberto Marchionatti is Professor of Economics at the University of Torino, Italy, where he teaches economics, history of economic theory and economic anthropology. Mario Cedrini is Assistant Professor of Economics at the University of Turin, Italy, where he teaches macroeconomics, international economics, history of economic thought and economic anthropology.